Let’s be honest. Almost nobody knows everything about how SEO (search engine optimization) really works. It’s a bit of a black art, and Google especially has been less than forthcoming in communicating best practices. But, over time, you can keep track of what seems to be moving the needle in the right direction for a business or brand. And, honestly, shouldn’t your business be focusing on things like increasing growth and revenue instead of dwelling on the right mix of SEO tactics that will benefit your company? Those who do this for a living have identified more than 200 SEO ranking factors that Google takes into account. But even that is way too much for businesses and marketers to get their arms around. So which key aspects of SEO should you focus on? To help address this issue, we’ve put together a checklist of 75+ actionable On-page & Off-page SEO strategies that, if incorporated correctly, can improve your site’s ranking in the search engine results. Here’s our SEO Mega-Checklist infographic, with accompanying text that explains each item. Let’s add some meat to the bones. Here’s are a few details to flesh out the SEO strategies for you to rank high in the search engines. It is advisable to have unique, undefined domain names for websites, as observed in case of big brands like Quicksprout and Backlinko. Country TLD extension (.in, co.uk), is useful if you want to rank higher in a specific country, as it helps you to boost your local search ranking, but it limits the global ranking of your site. It is important to be consistent on search engines. Thus, it is essential that you pick www or non www version and 301 redirect the other one. Further details and code can be found here. Semantic markup helps you to tell search engine robots what your content is all about, thereby making it easier for them to index it, which results in improved search engine ranking. However, it does not necessarily have to be fancy. Read more about Semantic Markup here. A sitemap not only speeds up search engine indexing, but it also informs Google quickly about any changes on your site. Thus, it is important that you create a xml sitemap and submit its URL to your Google Search Console. You can create the sitemap with the help of Yoast SEO Plugin for WordPress. While an XML Sitemap makes it easier for search engines to index your site, an HTML sitemap makes navigation of your site easier, thereby helping you to enhance user experience, and improve your search engine optimization. Don’t want certain Pages Folders or Files to show up on Google? Create a Robots.txt file in root, to prevent search engine robots from crawling and indexing specific areas of your website. You can even get a code for the same here. If you wish to read more about Robots.txt, head over to TorqueMag. Google loves Responsive websites! Mainly because responsive sites are compatible with Desktops, mobiles & tabs. Thus, it is important that you switch over to responsive web design, if you want to rank well on search engines and if you want to avoid Google’s Non-Responsive Website Penalty. 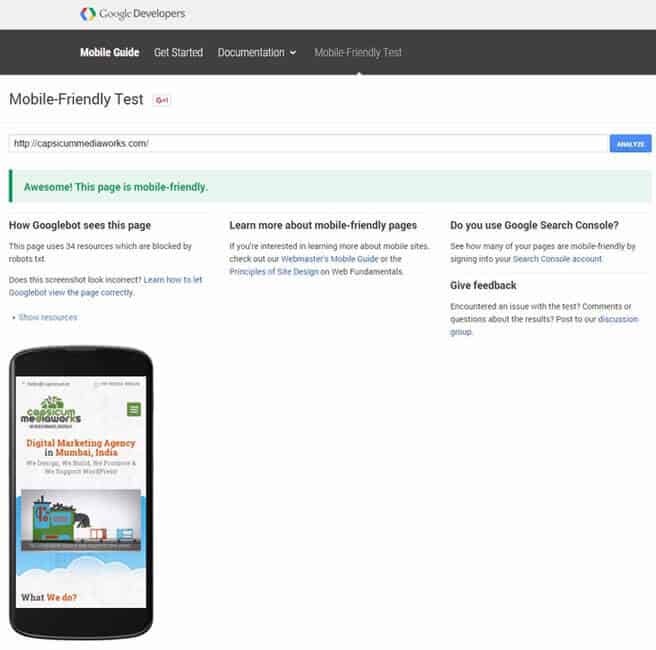 You can check if your website is mobile-friendly or not with the help of this Google’s tool. Heading Tags or h tags, help search engine robots to establish the relevancy of your content by providing basic description of the content, thereby maximizing your content’s visibility on search engines. You can learn more about the importance of H1 tag. By adding an Alt tag, you help search engine robots to read the text which is associated with those images, thereby facilitating faster & accurate indexing, which in turn improves the accessibility of your site on search engines. Here’s some more information on using alt tags for image optimization. Broken links halt search engine robots from indexing your web pages. Hence, it is important that you fix this problem immediately, to avoid hurting your website’s rankings. You can check for broken links with the help of the Broken Link Checker Plugin for WordPress. A cleverly composed page meta title (Max 60 Chars) and description (Max 140 Chars) improves the quality and quantity of your search traffic and helps search engines & users, to know what your page content is about.Yoast SEO Plugin for WordPress is the best tool for this. Breadcrumbs make your site more accessible to search engine robots. Plus, they help users to navigate your site better, which results in reduced bounce rate, leading to better search engine rankings. In other words, Breadcrumbs facilitate a better presentation of your URLs. Here are some instructions on how you can enable Breadcrumbs using Yoast SEO plugin. 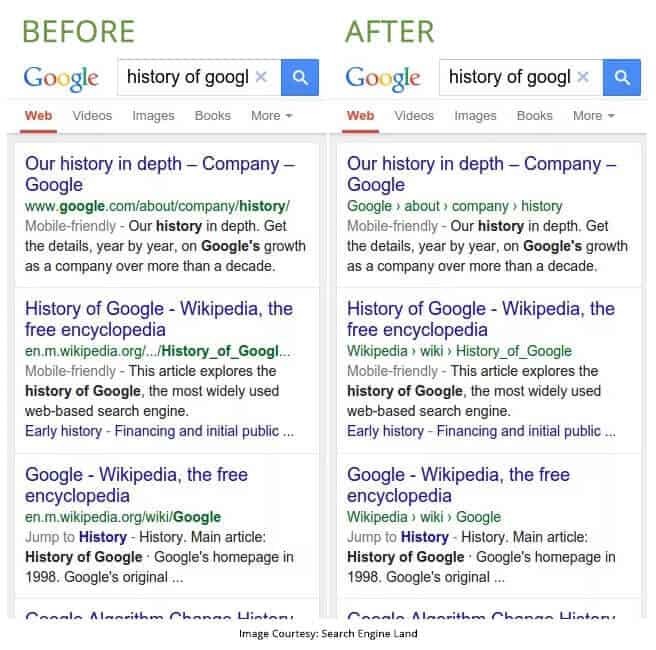 Google has recently decided to make some changes in its algorithm, which will give more value and importance to content displayed above the fold. Since this is the first thing that grabs 80% of a user’s attention, it’s important that the above the fold portion of your site’s web page has relevant content rather than unnecessary ads. Google doesn’t like unoriginal content. Duplicate content makes search engines’ task of indexing web pages, checking for relevancy, assigning link metrics, difficult. Thus, it is important that you check for duplicate content and remove it, to avoid losing search engine visibility. Duplicate content should not be more than 10% on the site. To check your website for duplicate content use Siteliner. Industry experts feel that the frequency of keywords no longer influences ranking, but their placement does. Hence, it’s important to write content which has relevant and naturally placed keywords, regardless of their number. LSI keywords are the ones related to the keywords that are searched on Google. Implementing LSI keywords helps you to optimize your article’s keyword density and it helps Google to judge the relevancy of an article, thereby increasing your site’s chances of ranking higher in the search engine results. You may also use tools like Uber Suggest & LSI Graph to find LSI Keywords. For best SEO results and improved ranking, it is important that you place your page’s best keywords in H tags, description & title, to let search engines know what the page is all about. However, make sure you do not spam or over optimize these areas by stuffing keywords in them. Internal contextual linking helps you to establish SEO-friendly site architecture, which helps search engine robots to index web pages more efficiently. Also, it helps to promote older content & it improves your site’s ranking for specific keywords. So, whenever you produce a new blog post, scan through the older posts and other web pages, and contextually link them internally. Optimizing images helps in reducing bounce rate, improves your site’s page speed & performance, and generates more traffic from image-based search engines such as Google Image Search & others. Plugins like TinyPNG plugin for WordPress, does a great job of optimizing images. Do not use the default settings. Create simple and SEO friendly permalinks. Make sure that the URL is short yet descriptive and contains the target keywords. Here’s an example of how you can shorten your URL. The structure of a URL matters. Thus, it is important that you keep your site’s URL as simple as possible and use hyphens to optimize your URLs. Included in Yoast WordPress Plugin, the Noodp & Noydir tags help you tell search engine robots, not to use information from these sources while displaying your site’s information on the search engine results. Linking out to relevant & high authority sites helps you to boost your search engine ranking and improves your site’s visibility. But make sure you only include sites with high page and domain authorities. You can check their Domain & Page Authority using the Moz Open Site Explorer. By linking out to diverse sources you not only make your content appear more natural, but also get more link juice from varied sources. The quality of the outbound links matters, not the quantity. Thus, avoid having too many outbound links, and only keep whose which have high page and domain authorities. Effective use of social sharing buttons is important for on-page optimization. It gives the users, the flexibility to share your site’s content with just one click, which in turn drives in more traffic to your site. You can optimize them using the Add To Any Share Buttons WordPress plugin. WordPress by default creates a single page for each attachment that you upload, which leads to indexing of duplicate pages. Thus, to ensure that your web pages are appropriately indexed without duplication, it is important that you create a redirect of your attachment pages with the help of Yoast, which will direct search engine robots to the correct (parent) page. Yoast plugin also has an option to enable or disable this for your website. Long content enriched with accurate statistical data converts better than short content. Moreover, it also helps you to get more outbound links and they do well on social media, thereby improving your search traffic. Create power pages with 2,000+ words content, which is epic and useful for your niche industry. Creating attention-grabbing headlines is where your focus should be, as it is the first impression of your article. When you write a headline, ask yourself, “Would this make me want to read on?” Here is some useful information on writing powerful headlines from industry expert, Neil Patel. An effective web copy is one that is benefit-focused. Does your article include something different, which as of yet is not shared by another writer? What benefit does your article offer to the reader? You can read more about some valuable SEO techniques and how to write benefit-focused content from Brian Dean. Integrating numbers into your content’s headline makes it powerful and clickable. Whereas bullets help you to present multiple points in an easy to digest format, and provide a visual break from the rest of your text. Using capital letters for the first letter of each keyword is important. Since keywords are an important factor in SEO, highlighting them in capital will help you to draw the readers’ attention to important information. Proofread to eliminate typos, spelling mistakes and check the grammar of the content, to ensure best quality content for viewers, and to improve search engine visibility. Show, don’t tell! Creating “How To” videos or using relevant images as part of content is the fastest way to attract a user’s attention and to speed up conversion. This article tells you how images and multimedia can improve user engagement. Updating your site’s content and blogs frequently helps you to gain more visibility on search engine, which leads to increase in traffic and conversion. Citation is an online reference to your business’s name, address & phone number on other web pages. Using local citation helps you to improve your local ranking and creates more brand awareness. Rel canonical tag helps you to eliminate duplicate URLs, thus facilitating faster and effective indexing, which results in improved Page Ranking. You can use Yoast plugin to enable or disable this for your website. A slow website will get you nowhere! To retain your viewers, get more traffic and improve your site’s search engine ranking, it is important that you optimize and improve your website’s page speed. You can easily check your website’s performance using tools like GTMetrix and Pingdom. Irrelevant pop-up ads are not only annoying, but they can also lead to increase in bounce rate, resulting in traffic loss and low ranking in SERPs. to grow your customer base. For this, it is important for you to take some time and learn about the art of optimizing your contact page. Google rewards sites that use SSL Certificate by boosting their rank on search engine. Moreover, since you are providing a secure service, it helps to improve customer trust. You can find some of the cheapest SSL options, starting from $4.99/year. Content delivery network (CDN) not only improves your site’s page speed, but also helps you to enhance your user’s experience, by reducing the response time, thereby improving your site’s ranking. Our personal recommendation would be Max CDN or CloudFare. If you are using Total Cache Plugin for WordPress, it has an option to setup CDN. Implementing a proper SEO strategy becomes thousand times easier if your website is powered by WordPress. Here is a list of some of the best WordPress SEO plugins, to help you optimize your site. By conducting a website audit, you’ll be able to enhance your website performance, which will improve your site’s conversions. You can easily audit your website with a tool called SEO Optimizer. 301 Redirect helps you to preserve the SEO value of a web page, by transferring page rank, domain authority, etc, to a new page, thereby preserving your ranking in SERPs. Use the User Redirection plugin for WordPress to manage your 301 redirects. Improve your site’s organic search ranking by optimizing your social share images with Yoast SEO. Here is a detailed guide on how to set-up Yoast SEO Plugin to optimize social sharing images. According to Neil Patel, social signals impact search engine rankings. Therefore, it is advisable to be active on social sites as search engines use data from these sites to rank your website. Enhance user experience and improve your site’s performance, by selecting search engine and user-friendly web design. Thin or low-quality pages add little or no value to your site. By implementing a no-index tag on these pages, you tell search engine robots not to index them. In other words, to maintain a standard for your website, it is best to get rid of low quality, thin content. By publishing the usually static Privacy, Contact Us, About Us pages, you can improve your site’s visibility and rank higher in search engine result pages. Test your website’s browser compatibility, to avoid losing search traffic.Use BrowserStack to check your website’s cross-browser compatibility. Google Search Console gives you insights into which keywords are popular on your site, what web pages have been indexed, and a list of external & internal links, and more. Submit your site’s local listing on Google My Business, to boost your local SEO and improve your site’s visibility. Google’s Disavow Tool helps you to remove spammy & unnatural links from your site, thereby improving your site’s ranking on search engine. Social bookmarking is an excellent way through which you can generate quality backlinks and get more targeted traffic to your site. Link baiting is all about encouraging people to link to your site by producing quality, useful & informative content. Google loves displaying reviews in search results. Also, positive reviews of your brand increase user trust, resulting in higher CTRs & conversions. Posting on web forums helps you to generate high-quality backlinks and bring in more traffic to your site. Facebook Ads Keyword Tool is a great way to research and find long-tail keywords that are frequently used by users. Investing in PPC and Adwords helps you to get the best combination of title and description, thereby increasing your click-through-rate and resulting in more traffic & conversion. Regular reviewing of your Google Analytics Account will give you an insight into which SEO techniques are working and which are not. In other words, it offers an in-depth analytical insight into your website’s traffic and performance. To get an accurate data of your site’s performance, it is important that youexclude Internal IP addresses from Google Analytics. Keyword Planner Tool provides you with all the necessary information needed to conduct keyword research. An established (older) Domain earns a significant level of trust from Google than a newer domain. However, it’s not extremely essential for better ranking on search engines. Therefore, having a new domain is not such a major concern, as at some point it will become more established and older. Having a long established domain name is mainly beneficial in getting backlinks. You can read more on domain age here. Infographics are one of the most popular methods to increase your site’s traffic with quality content, and to procure high-quality authority links.Here’s what you can do to create infographics that generate valuable backlinks. A good Outreach strategy is one of the most effective ways of enhancing your SEO. Not only does it help you to get better & relevant links from quality sites, but it also helps you to develop strong connections with influential bloggers. Guest blogging helps you to boost your site’s organic search ranking, by improving your site’s visibility on search engines. Respond to questions on Quora and if there is a specific article on your site that helps reinforce your answer, you can link to it. Search for broken links on relevant websites and point out any existing ones to the website owner. Then, ask them if they want to replace it with a link to your related article, so you can get a quality backlink. You can read more about how to generate high-quality backlinks here. Look for broken links on the relevant Wikipedia pages and replace them with yours. Getting a backlink from Wikipedia is very good for improving your website’s search engine visibility. Review important link metrics of your website and that of competitors with the help of Moz Open site Explorer . It shows you important data, such as page authority, domain authority, backlinks, anchor text etc, through which you can understand your competitors link building strategy. 75. Set-up An RSS Feed For Your Blog.